LONDON (Reuters) - The dollar headed for its biggest weekly rise since May on Friday as economic data reinforced expectations of a U.S. interest rate hike this year. European shares steadied on the view that Greece will secure a bailout. The dollar hovered near a seven-week high against a basket of major currencies, boosted by lower U.S. jobless claims. The dollar index is up 1.7 percent this week. The euro was mired close to a seven-week low of $1.0854, hit in the previous session. The dollar touched a three-week high of 124.23 yen. Speculation over the timing of the next U.S. rate rise has returned to the forefront, with investors looking to U.S. CPI data and Michigan sentiment data later in the session for clues. "The focus is turning to the U.S. rate cycle, and (the market reckons) a September rate hike is still, if not probable, at least possible," RBC Capital Markets global head of FX strategy, Adam Cole, said. "That's picked up from Greece as the main driver of our market ... From now the euro goes down primarily because the dollar is going up." Euro zone shares eased as a relief rally over Greece's bailout agreement ran out of steam. 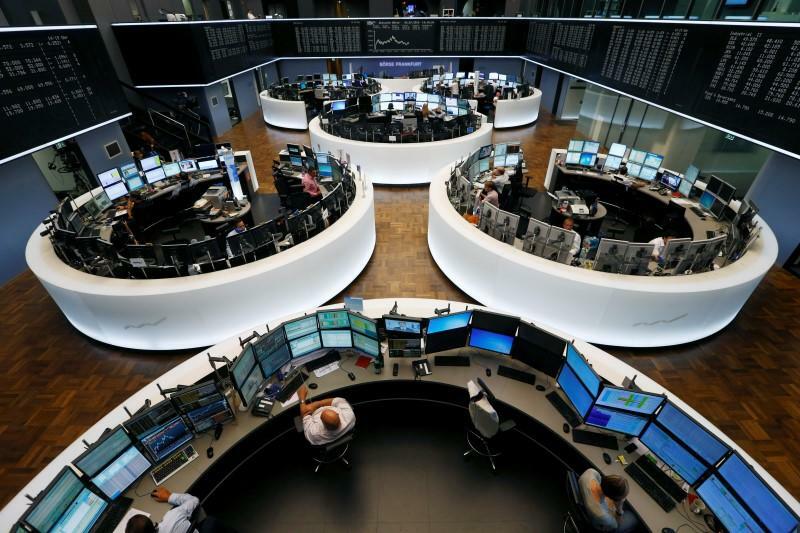 The Euro STOXX 50 lost 0.1 percent but has rallied 8 percent over the last two weeks, its biggest fortnightly gain since January. German yields were lower at the opening of a parliamentary debate in Berlin, as the government sought approval for talks on a third bailout programme for Greece. Following its successful passage through the Greek parliament, German lawmakers are expected to give Berlin a green light to start negotiations. Analysts said that with the risk of a Greek exit from the euro zone diminished, the market would focus again on policy divergence between the Fed, which is pondering rate rises, and monetary easing by the European Central Bank. "There is a little bit of an anticlimax after the Greece headlines... A lot of people did not expect the worst to happen and so money had already poured in," said Peregrine & Black trader Markus Huber. "Along with the focus on central bank timing of interest rate hikes, both (Bank of England governor Mark) Carney and (Federal Reserve President Janet) Yellen, that's probably why the market is going back and forth." Sterling hit its highest against the euro in more than 7-1/2 years after Carney said the decision to raise rates will come into "sharper focus" around the end of 2015, his strongest hint yet about the timing of the bank's next move. The MSCI World Index, which tracks stocks from developed economies, is up 2.2 percent this week, its biggest weekly gain since May. MSCI's broadest index of Asia-Pacific shares outside Japan was up 0.3 percent as Chinese shares recovered further, helped by government support measures after their recent crash. Advancing for the second straight day, Shanghai shares rose 3.5 percent. Although drastic government measures have managed to stem its slide, the benchmark Shanghai index is still down roughly 20 percent from a 7-1/2-year peak reached a month ago. Concerns over demand from China are also weighing on copper, which fell over 1 percent and is near a 6-year low. Brent crude oil rose slightly, though a supply glut kept prices pinned near $57 per barrel. Plentiful supply also crimped platinum prices, which fell below $1,000 an ounce for the first time since February 2009.